Choosing the correct filling machine for your application is an important decision and one that should take into account the product being filled, the containers it is being filled into, the production environment, and the production goals. Our entire team is friendly and ready to help you determine which machine is best suited to your needs. 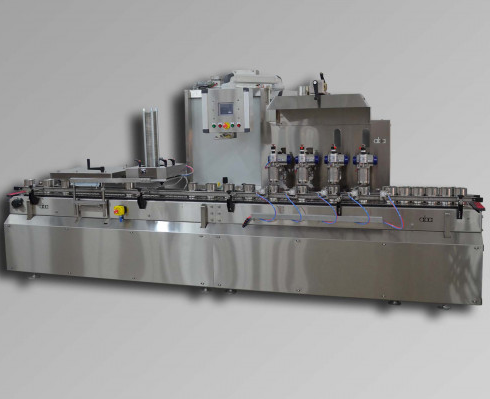 Take a look at three advantages of using a net weight filling machine below. One of the main reasons to look towards a net weight filling machine over a volumetric machine would be accuracy. The containers are filled on scales which monitor the exact weight of the product in real time. The load cells on the scales then communicate with the machine and the operator to either automatically make adjustments, or notify the operator that adjustments are required that need to be manually input. The result is that these machines have highly precise and accurate fills which can be easily adjusted and tailored to suit different products and containers. When compared to a volumetric filling machine, a net weight filler has fewer wetted parts which need to be cleaned of product. Simply put, the ball valves and fill heads and their associated tubes are the only components which need to be flushed or cleaned of product. Our net weight filling machines utilize the latest technologies to provide real-time data and tracking of fill cycles. These programs also have the capacity to store up to 100 individual recipes which make size changeover and plant shift changes seamless and hassle-free and mean that results are repeatable and reliable. If you need the team at ABA to customize a net weight filling machine for your business, just reach out to us by calling +1 (803) 396-0621 right now. We look forward to providing you with custom solutions.